Apparently, $32 million doesn’t go as far as it once did with regulators in Washington, DC. Nor do big-time fundraisers, golf outings and exclusive CEO dinners with the US president. This week, cable giants Comcast Corp (NSDQ: CMCSA) and Time Warner Cable (NYSE: TWC) pulled the plug on their proposed hookup—after the US Justice Dept and Federal Communications Commission (FCC) discouraged any notion of a compromise that would earn regulatory approval. For several months, we’ve warned Conrad’s Utility Investor readers that this deal could fall through and advocated taking profits on both stocks as a precaution. (Every issue of Conrad’s Utility Investor covers mergers and acquisitions activity in depth.) Our outlook hasn’t changed even though the transaction won’t move forward. In fact, thanks to the market’s positive reaction to the deal’s failure, investors have another chance to take their money and run. As Moody’s Investors Service indicated last week, the transaction’s death is credit negative for Comcast and Time Warner Cable, as the combination would have created massive cost synergies and created a nationwide platform. Without the deal, Comcast and Time Warner must contend with increased competition from AT&T (NYSE: T) and Verizon Communications (NYSE: VZ). These formidable competitors boast superior communication networks and no costs related to legacy video systems. Deep-pocketed newcomers like Google (NSDQ: GOOG) also pose a threat. Even worse, regulators’ rejection of the deal provides a sure sign that Comcast won’t get a free pass to do as it wishes. Although the FCC and Dept of Justice initially reacted favorably to the deal, regulators bowed to mounting political pressure—a challenge that will only intensive as the next presidential election approaches. Expect federal action on a number of issues that could present more challenge for cable television providers, an industry that’s ranked dead last in recent surveys of customer satisfaction. Comcast’s shares trade at an all-time high—a clear warning that the market hasn’t priced in regulatory or competitive headwinds. As for Time Warner Cable, speculation continues to run rampant that Charter Communications (NSDQ: CHTR) will bid as much as $175 per share to take Comcast’s place at the table. This rumor has pushed Time Warner Cable’s shares toward an all-time high. Investors should view this deal and the price with skepticism. Charter Communications once offered to pay $132 per share for Time Warner Cable—an increase from its first proposal of $130 per share—when Comcast submitted a takeover bid of $160 per share. We doubt that Charter Communications would up its offer by more than $40 per share at a time when the only credible competitor has dropped out of the process. Why wouldn’t Charter Communications quash the rumor with the hint of a much lower bid and propose a takeover offer in the range of its earlier bids once the stock drops. Don’t forget that Charter Communications would also need to run the regulatory gauntlet to complete the acquisition of Time Warner Cable—a major challenge. Bottom Line: Comcast and Time Warner Cable’s sky-high valuations suggest that investors remain overly optimistic about an industry that just took a powerful kick in the teeth. Comcast and Time Warner Cable continue to rate a Sell in my Utility Report Card, a feature where you can find vital statistics and my regularly updated comments on more than 200 essential-services stocks. 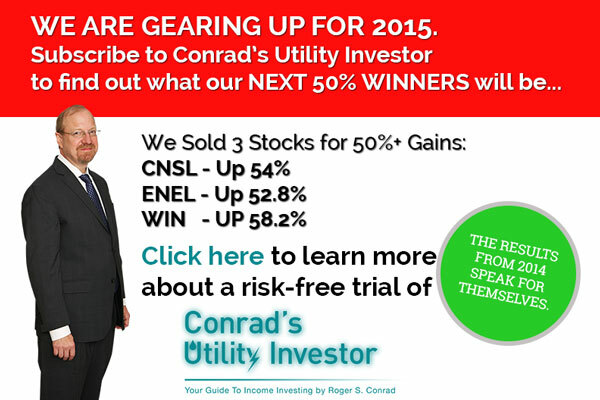 This feature is available exclusively to Conrad’s Utility Investor subscribers. Not a subscriber? Learn more about why I left Utility Forecaster and how you can save big on a subscription to Conrad’s Utility Investor. However, we remain bullish on AT&T and Verizon Communications, both of which pay generous dividends and continue to make all the right moves. These telecom giants reported solid first-quarter results that show them gaining ground on Sprint Corp (NYSE: S) and T-Mobile US (NYSE: TMUS), desperate rivals that continue to undermine their own profitability with aggressive promotions. AT&T and Verizon Communications have the cash flow and balance sheet to outspend any rival as they continue to build the nation’s leading broadband networks. Even better, AT&T’s shares yield 5.4 percent, while Verizon Communications offers a current return of 4.4 percent. With paltry yields and a risk-reward balance that skews toward the downside, Comcast and Time Warner Cable are overpriced names that offer little appeal to income-seeking investors. Steer clear. We’ll have in-depth analysis of AT&T and Verizon Communications’ quarterly results in this week’s Utility Roundup.